Crazy Salesman cartoon. 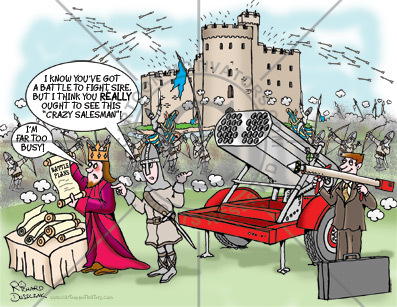 Crazy Salesman cartoon, battle to fight, too busy to see him, crazy salesman postcard, battle plans, rocket launcher, Battle of Egincourt, I KNOW YOU’VE GOT A BATTLE TO FIGHT, SIRE. BUT I THINK YOU REALLY OUGHT TO SEE THIS “CRAZY SALESMAN”! King engrossed in looking at his Battle Plans responds: "I'm FAR TOO BUSY!" Having trouble getting that meeting? Can't get through to the person you really need to speak to? Prospects not answering your emails? It's easier if there's a crack in the door to help you leverage it! How do you knock on the door and get someone to open it? If you are in sales and/or marketing you know one of the most challenging aspects of what you do is getting in front of prospects. The question becomes: How do you keep your promotional advertising and unique marketing items out of the trash and on your prospects desk? The answer is simple: use creative and appropriate methods to get recognized - like cartoons, cartoon strips and humorous illustrations. The following cartoon could be used to send via email, or as a postcard/greetings card or part of a letter. The humour will break the ice and get your foot inside the door!